Heat oven to 350. Grease a loaf pan. In a large bowl, mix together the butternut squash puree, eggs, butter, water, vanilla, and sugars until thoroughly combined. In a separate bowl, whisk together the flour, baking soda, salt, cinnamon, nutmeg and cardamom. Stir the dry ingredients into the butternut squash mixture. Mix just until incorporated; Be sure not to over mix. Pour into the loaf pan and sprinkle with the nuts. Bake for 55-6o minutes or until a cake tester inserted into the center of the loaf comes out clean. In a large pot, heat the oil over medium heat. Add onions, peppers, and spices and cook for about 8 minutes. Add the broth and squash and bring to a boil. Reduce heat and simmer for 15 minutes or until the squash is tender. Stir in the corn, beans, salt and pepper and cook for another 5 minutes. Ladle into bowls and garnish with remaining basil, lime wedges, and serve with hot sauce. Heat oven to 400° . 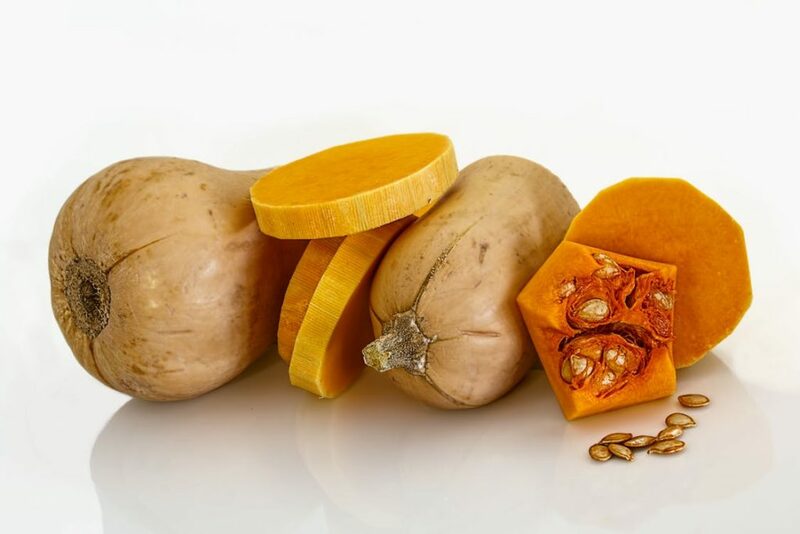 Cut squash in half lengthwise and scoop out seeds. Place cut side down in a baking dish and add ½ cup of water. Bake for about 45 minutes or until easily pierced with a fork. Reduce oven to 350° . Remove squash from oven and let cool; scoop squash out of shell, separating the strands with a fork. Spread in a greased 1 ½ quart baking dish. While squash is baking, cook beef, onion, and garlic until meat is browned and onion is tender, about 10 minutes. Add tomatoes, tomato paste, oregano, salt, and pepper. Bring to a boil, reduce heat, and cook for 5 minutes. Spread sauce over squash, sprinkle with the cheese, and bake, uncovered, for 25 minutes or until lightly browned and bubbly. Serves 6. Peel the squash. Cut in half lengthwise and scoop out seeds. Cut squash into ½ inch thick slabs and then cut slabs into ½ inch dice. In a heavy-bottom saucepan, melt the butter over medium heat. Add the squash cubes and shallot and cook, stirring often, about 8 minutes until softened. Stir in the rice. Add the wine and cook, stirring, until wine has evaporated, about 2 minutes. Reduce heat to medium and add 1/2 cup hot broth mixture. Cook, stirring, until almost all liquid is absorbed. Continue adding hot broth to the rice, 1/2 cup at a time, stirring constantly, until liquid is absorbed before adding more broth. This will take about 30 minutes. It’s labor intensive but it will be worth it! Stir in Parmesan, sage, and sea salt and white pepper to taste. Heat the oven to 450°F. Place squash cut side up on a baking sheet, brush 1 tablespoon of the melted butter over the tops and insides of the squash halves, drizzle with maple syrup, and sprinkle on salt and pepper. Bake until fork tender, about 25 to 30 minutes. Meanwhile, place 1 tablespoon of the melted butter in a large skillet over medium heat. Add the onion and celery, salt and pepper. Cook, stirring, about 10 minutes. Stir in the herbs and cook 1 more minute. Remove from heat and stir in the rice, pecans, cranberries, and 1 teaspoon salt and pepper to taste. Divide the rice filling among the roasted squash halves and drizzle the remaining tablespoon of butter over the top. Bake until the squash is completely tender and browned and the filling is heated through, about 25 minutes.